The Buffalo Bill Center of the West, formerly known as the Buffalo Bill Historical Center, is a complex of five museums and a research library featuring art and artifacts of the American West located in Cody, Wyoming. Founded in 1917 to preserve the legacy and vision of Col. William F. "Buffalo Bill" Cody, the Buffalo Bill Center of the West is the oldest and most comprehensive museum of the West. It has been described by The New York Times as "among the nation's most remarkable museums." The complex can be traced to 1917, when the Buffalo Bill Memorial Association was established after the death of William F. Cody, the original Buffalo Bill. Gradually other elements were added to what started as a historical center. The current seven-acre building has 50,000 artifacts and holds five "museums". Since 2008, the Center of the West has been part of the Smithsonian Affiliates program, the first museum in Wyoming to have this status. As an Affiliate, the BBHC has hosted Smithsonian artifacts. It has also recently loaned some of its own vast collections to a Smithsonian exhibition in Washington, D.C.
"The exhibition [on Buffalo Bill] affirms what the center as a whole demonstrates: that behind the mythologizing is something worth cherishing, even if it is flawed, complex and still evolving. The old impulse to demolish the myth has been put aside. Debuting in summer 2012, the Buffalo Bill Museum has been reconceived to present a 21st-century experience for its visitors. The inaugural museum opened in 1927 in a log cabin across from the current location. It was reinstalled in 1986. Now it is part of a five-museum complex. The Museum offers a wide-ranging view of the life and times of William F. Cody, as well as of the "Buffalo Bill" character he created, which made him the world's most celebrated person of his time. The story of "Man of the West, Man of the World" presents an interactive narrative of this complex man. The museum showcases the fame and success Cody attained through his "Buffalo Bill's Wild West show", and addresses his significant influence on the economic and cultural development of the American West. The exhibits also reveal an intimate portrait of this major American figure - his personal successes and failures, and financial fortunes and misfortunes. The Plains Indians Museum features the stories and objects of Plains Indian people, their cultures, traditions, values and histories, as well as the contexts of their lives today. Since 1979, the Plains Indian Museum has been a leader in promoting public recognition of the importance of Plains Indian art due to its nationally significant collection. The first curator was A'aninin tribe. The majority of the collection is from the early reservation period, ca. 1880-1930. It contains artifacts primarily from Northern Plains tribes, such as the Arapaho, Lakota, Crow, Cheyenne, Blackfeet and Pawnee. The holdings also include important contemporary objects, ranging from abstract art to star quilts. In September 2007, the Buffalo Bill Historical Center acquired the Paul Dyck Plains Indian Buffalo Culture Collection, recognized as the most historic and important privately held collection in the world of Plains Indian artifacts, art work, and related materials. The collection includes clothing, eagle feather bonnets, bear claw necklaces, buffalo hide tipis and tipi furnishings, shields, cradles, peace medals, and moccasins. It dates from the late 18th century to pre-1890s. The Plains Indian Museum also sponsors ana annual Powwow held on the third weekend in June at the Robbie Powwow Garden at the BBHC. This event attracts dancers, artisans and visitors from all over North America. The Whitney Western Art Museum features paintings and sculptures of the American West. The gallery first opened in 1959 and was later united with the Buffalo Bill Museum. In June 2009 it re-opened following a re-installation. The gallery is organized thematically, with spaces dedicated to heroes and legends, the heroic cowboy, wildlife, horses in the West, inspirational landscapes, first people of the West, and the Western experience. Replicas of the studios of both Edgar Samuel Paxson, Alfred Jacob Miller, Thomas Moran, Albert Bierstadt, Alexander Phimister Proctor, W.R. Leigh, Joseph Henry Sharp and N.C. Wyeth. Contemporary Western artists include Harry Jackson, James Bama, Deborah Butterfield, Fritz Scholder, and the sculptor Grant Speed. Interactive stations allow visitors to create their own works of art. The renovation and expansion was designed by Curtis W. Fentress, FAIA, RIBA of Fentress Architects. 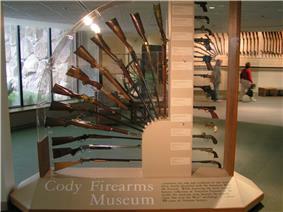 The Cody Firearms Museum houses the most comprehensive collection of American firearms in the world. The collection includes firearms ranging from a 16th-century hand cannon to guns of modern manufacture. It holds weapons from almost every significant gun manufacturer in the world. The Winchester Collection, the heart of this museum, was transported from New Haven, Connecticut to Cody in 1976. Dedicated in 1991, the Cody Firearms Museum provides a permanent home for the Winchester collection as well as the largest collection of DuBiel Arms Company rifles in the United States. Visitors can learn about topics in firearms manufacturing, including factory workers, business competition,and innovations in production. Within the exhibits, visitors are able to trace the evolution of modern firearms technology from its earliest days through today's variations. Membership to the Cody Firearms Museum allows access to the Cody Firearms Museum Records Service, which provides information from original factory records of the Winchester, Marlin or L.C. Smith companies based on the make and serial number of the firearm. The Draper Natural History Museum features approximately 20,000 square feet (1,900 m2) of interactive exhibits highlighting geology, wildlife, and human presence in the Greater Yellowstone region. Videos, natural history dioramas and photography replicate the sights, sounds, and smells of the area. Specimens of grizzlies, wolves, bighorn sheep, moose, elk and other wildlife are on display. The Draper Natural History Museum opened to the public on June 4, 2002 and bears the name of Nancy Carroll-Draper, a trustee and benefactor of the Buffalo Bill Center. The Draper museum includes adult and children's classrooms and the John Bunker Sands Photography Gallery. The renovation and expansion was designed by Curtis W. Fentress. The Harold McCracken Research Library houses a collection of 30,000 books, over 400 manuscript collections, and more than a half-million photographs. Named in honor of Harold McCracken, writer, artist, and developer of the Buffalo Bill Center of the West, the library supports “inquiry across many disciplines related to the American West.” The library has strong collections relating to Buffalo Bill, the Wild West show, Plains Indians, cattle and "dude" ranching, the fishing and hunting industries, the oil industry, Yellowstone National Park, and the Winchester Repeating Arms Company. The work of Wyoming photographers Charles Belden, Stan Kernshaw, Jack Richard, and F. J. Hiscock are foremost among the library’s holdings. Researchers and the public are welcome to visit the library by appointment. ^ "Buffalo Bill Center of the West". Affiliate Detail. Smithsonian Affiliates. 2011. Retrieved 15 Jul 2011. ^ "Buffalo Bill Historical Center Now a Smithsonian Affiliate". Old West New West. 2008. Retrieved 15 Jul 2011. ^ "George P. Horse Capture dies at 75; Native American curator". LA Times. Retrieved 6 May 2013.